Forget about expensive consultants. Now you can discover RCM on your own time, NOT someone else's. Less than one-third the cost of live training. Certificate of Completion. NO TRAVEL REQUIRED! Chapter one includes an introduction to the RCM process. It also explains the history and evolution of RCM. Introducing An Exciting New Way to Get RCM Training! RCM is one of the most powerful asset management processes that can be employed. Contrary to criticism about the process, RCM can be carried out swiftly and efficiently when done properly. Additionally, RCM’s principles are so diverse that they can be applied to any asset such as an airplane, nuclear power plant, truck, tank, ship, manufacturing plant, offshore oil platform, mobile air conditioning unit, tow tractor, jet engine, a single pump, or an engine control unit. RCM principles can be widely applied to an entire asset or more narrowly applied to select pieces of equipment. The name Reliability Centered Maintenance lends itself to a process that is used to develop proactive maintenance for an asset – and it is. But RCM can be used to formulate scores of solutions that reach far beyond maintenance. These solutions can offer tremendous benefit to an organization. Nevertheless, when applying RCM, many organizations only focus on the development of a proactive maintenance program which doesn’t take full advantage of RCM’s powerful principles. It’s often misunderstood that Failure Modes and Effects Analysis (FMEA), Failure Modes Effects and Criticality Analysis (FMECA), and Condition Based Maintenance (CBM) are separate and distinct processes. NOT TRUE. When you do RCM, you do them all, and don’t let anyone else tell you differently. For over 20 years, we’ve helped our clients increase safety, decrease costs, and boost profits by implementing Reliability Centered Maintenance correctly. We’ve worked with government and commercial industry involving equipment as far-reaching as aircraft, manufacturing equipment, assets used at sea, and ground support equipment. Nancy Regan is the founder and President of The Force, Inc., a company dedicated to the implementation and promulgation of Reliability Centered Maintenance principles as they were originally intended. Nancy is a graduate of Embry-Riddle Aeronautical University with a B.S. degree in Aerospace Engineering. As a U.S. Navy civilian employee for seven years, she completed Naval Aviation Maintenance Officer School. She then became Team Leader for RCM at the Naval Air Warfare Center, Aircraft Division, Lakehurst, NJ, where she instituted the RCM Program on Naval Aviation Common Support Equipment. 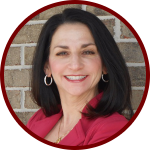 In 2001 she founded The Force, Inc. Nancy has over 20 years experience of hands-on practice facilitating RCM analyses, conducting RCM training, and assisting her clients in implementing RCM programs. Amongst the many projects, she has facilitated is the CH-47 Chinook Helicopter., the US Army’s heavy-lift helicopter. Nancy holds U.S. and foreign patents on a process for marking parts that she developed using her RCM experience. She is the author of The RCM Solution, A Practical Guide to Starting and Maintaining a Successful RCM Program. Nancy resides in Huntsville, Alabama with her husband, Dennis. Enter your details below to be notified of Nancy Regan's upcoming speaking engagements. This book is a "how-to" generic approach with minimal theory by a well-known and very active participant in the leading maintenance organizations and conferences. The book offers a fundamental, common sense understanding of RCM. A significant portion is dedicated to SAE JA1011 compliant RCM. 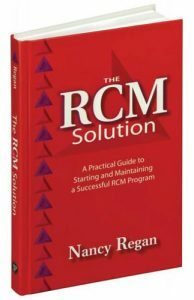 The book presents detailed processes that can be used when RCM is not applicable and presents a total solution for implementing RCM for any organization. The primary market for this book is anyone responsible for Physical Asset Management within an organization, at any level of authority. The material will be just as valuable to an organization's maintenance manager as it would to the organization's leader. The book's principles are presented generically so they are equally applicable to any industry in the world that has assets to care for - military, manufacturing, mining, plastics, power generation, etc. There is also a secondary market for this book at colleges and universities teaching reliability engineering. Do you have any questions? We would love to hear from you! Just fill out the form below and we'll get right back to you!